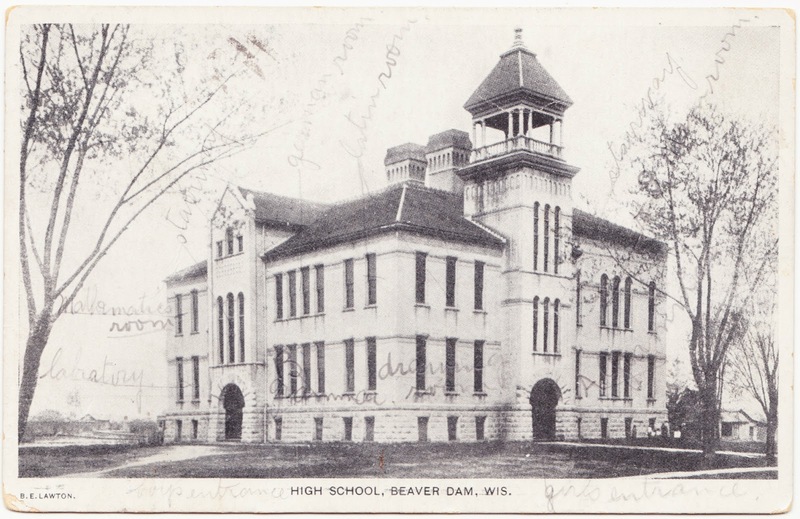 If you look closely at the front of this 1907 postcard and squint, you can see that someone has added, in pencil, some locations and descriptions of the rooms within the high school in Beaver Dam, Wisconsin. This was at least two high schools ago for Beaver Dam, if not three. I'm not even sure if this is the building that actor Fred MacMurray (1908-1991) would have gone to when growing up there. If anyone out there has any insight about the history and fate of this particular building and can share, that would be wonderful. Those are the ones that I can make out. I think that leaves a couple that are simply illegible at this point. It's pretty neat insight, though, to have this level of detail about a high school of 110 years ago. Hello Della. Are you coming down to the Fair this yr? How do you like school again? Tell Mae please, that she should send my mail in care of J.A. Wrensch [? ], B.D. Wis. How is your mother? We expect to have a jolly time at the fair, wish you could come.